The budget as a collective process. The budget being well received. What the speaker liked best about the budget. A budget that truly reflects the values of the people of this province. Education and health care. Some figures. Valuing the role of government in helping those who live on the edge, in poverty, with very meagre means. Dollars into the developmental-services sector. Presenting a balanced budget. Strengthening the economy. Working to eliminate the capital tax in Ontario. Transforming the property tax assessment system. The impact of the budget on the city of Toronto. New investments in the Ontario Arts Council and the Ontario Trillium Foundation. Launching Luminato. An initiative to deal with climate change. Much more to do but entering a new era of economic strength. The Honourable Greg Sorbara is Ontario's Finance Minister, and yesterday he brought in his government's fourth budget. It is something of a tradition here at the Canadian Club that we host a lunch with the Finance Minister in the days following the budget, and I am frankly always amazed that they are still standing. The budget process is a grueling one. It involves literally months of briefings, discussions, debates about policy, debates about messaging, decisions made, decisions reversed, priorities set, priorities questioned. The annual budget is the most important document a government produces. It is the document that lays out the government's priorities, and demonstrates to taxpayers how their precious money will be spent. In today's accountability-focused climate, a budget can easily be seen as a government's contract with taxpayers. And in an election year, which this is, it is also a key platform document. Little wonder, then, that so much work goes into getting the budget just right. And little wonder that it is considered to be one of the most difficult jobs in government. Because it's not just about spending money, it's about finding money. It's about realizing you don't have the money you thought you did. It's about enormous pressure to spend money you don't have on programs people desperately need, and the enormous competing pressure to cut programs people desperately need in order to save money and balance the books. Budgets are all about competing pressures and competing interests, and it is a wily and talented Finance Minister who is able to walk that fine line. Minister Sorbara has a long and distinguished history of public service and private-sector achievement. He was first elected MPP in 1985. In the previous Liberal government, he held a series of senior cabinet posts, including Colleges and Universities, Skills Development and Labour. He returned to the private sector in 1995, where he served as a partner in the Sorbara Group, an Ontario-based land development and property management company. He also served as Director of the United Way for York Region. He was re-elected as MPP for Vaughan-King-Aurora in a 2001 by-election, and after the 2003 general election became the McGuinty government's Finance Minister. He gave us a budget yesterday that is a classic example of walking the fine line between competing priorities and interests. From the new Ontario Child Benefit for low-income families to an increase in welfare rates and a hike in the minimum wage, this was a budget that could be seen to be a poverty fighter. But with a business tax cut, an acceleration in the elimination of the capital tax and books that are not only balanced but in surplus, this was also a budget that could be held up as fiscally responsible and business friendly. As I said, it's a budget that walks a fine line, and the man responsible for it is here today to tell us all about it. Ladies and gentlemen, please welcome to our podium today the Finance Minister for the Province of Ontario, the Honourable Greg Sorbara. Well thank you very much. It is a thrill to be back here. I think it is a great tradition that you have of inviting finance ministers to come and speak after their budgets. Given that there is an election coming up, can I simply say that I hope I'm available for years to come. I remember my first invitation. It was after our first budget and those were tougher times and you were very, very welcoming. You will see some bleary-eyed people amongst you. If they look as though their bags are a little bit more pronounced than usual, they work in the Ministry of Finance. I'm delighted that they have come here today to this lunch. I make the point of underlining the fact that a budget is a collective process. It is the entire government reexamining its priorities and identifying those priorities in one concise and articulate document. But there is a special tribe within the Ministry of Finance that really burns the midnight oil for literally months. This budget is being very well received. It's a tribute to the work that all of them have done under the leadership of my Deputy Minister Colin Anderson and my Chief of Staff Diane Flanagan. They have worked tirelessly and I want to use the occasion to publicly thank them. Since I presented the budget, people have been asking me repeatedly in interviews and informally what I liked best about our budget. I'm going to try and answer that question through the course of my remarks today. But to sum it up, I think what I like best about this year's budget is that it truly reflects the values of the people of this province. I think when a government can do that it is on very solid ground. This province values the quality of public education. This province knows how important public education is. And this province knows that when we were elected four years ago public education was not in a good state. Our schools now are better places to learn. Anyone who is still unsure of that needs to visit a public school, needs to talk to teachers, needs to look in the eyes of students, needs to know that we no longer lose millions and millions of student days in strikes. Kids and their teachers are thriving in our schools in this province and we continue to invest in public education in our budget. The people of this province value a strong and healthy and responsive health-care system. It is our core business. Roughly 45 per cent of every dollar that you send to us is used to strengthen health care. In this budget we are allocating some $37.9 billion to improve health care. I want to say how pleased I am that in our continuing expansion and strengthening of health care that this year we were able to add pediatric surgeries to our wait-time strategy and that means an awful lot to the folks at Sick Kids Hospital. The people of Ontario value post-secondary education. They understand that our true strength and the quality of our society is really going to be about how well we educate ourselves. Two years ago the budget was about post-secondary education, $6.2 billion additional resources in that sector. We have got a lot more to do but we took some major steps then and we continue to invest today. The people of this province also value the role of government in helping those who live on the edge, those who live in poverty, those who live with very meagre means, those whom society pays little attention to. We haven't done much of that in Ontario for a very long time and with this budget we turn the page. We are making significant investments in the lives of children living in poverty, $2.1 billion over the course of the next five years. We are turning the page on the way in which we have designed our system of social support. It is extremely important because it reflects the values of this province and we haven't spoken to those values very much over the course of the past many years. But it is not just benefits for children that we are transforming. We are allocating almost $400 million in additional support for better housing. Nothing is more important to those vulnerable populations than a home. With this budget far more people are going to have an address that is a good strong home. We are also adding over the course of four years $200 million into the developmental-services sector. Let's translate that back into simpler English--those working people, men and women, who look after Ontario's disabled population, those who for the rest of their lives will live with disabilities whether of a mental sort or a physical sort. That sector, through 19 pre-budget consultations, told me clearly it needs help. This province also values governments that live within their means. I can't tell you what a joy it is for a minister of finance to present a balanced budget. We have been working hard at this for quite a long time. Three and a half years ago this province was deeply in debt, and it was floundering and things were out of balance at Queen's Park. We have worked diligently. And this is not just magic that before an election we have presented a balanced budget. Absolutely not. You look at the progress that we've made from day one. Each financial year we have outperformed. In the first year we were down to a deficit of $1.8 billion and the year that we are just in that finishes in eight days will finish on the positive side of the ledger. We will have a surplus of about $310 million at the end of the current year. The year that we are coming into, the budget year, we anticipate a surplus of about $400 million. But it is not just enough to balance the budget. It is equally important to place a premium on the value that the people of Ontario place on governments that can strengthen the economy. From the perspective of a finance minister, every budget is the same. The test is: does it add to the economic fundamentals of the province? I'm absolutely thrilled at the way in which we have been able to initiate programs and restructure programs with a view to strengthening the economy. I think first and foremost among those initiatives is a full transformation of a very poorly designed business education tax. I'm not sure how many of you follow issues of taxation, but let me put it in simple terms. Does it make any sense at all when a business in the city of Toronto pays business education tax rates that are much higher than businesses across the way in Mississauga or in Vaughan? It just eschews fairness and competitiveness. So we are transforming the system. Over the course of seven years, we will lower business education tax rates in every municipality where the rate is higher than 1.6 per cent. Within seven years we will have reduced business education taxes by some $540 million and I have got to tell you when a finance minister has an opportunity to reduce taxes you know that things are going pretty well. We've also decided to make a firm legislative commitment to eliminate the capital tax in Ontario. Those of you again who follow this stuff know that capital taxes are taxes that reduce job creation, that hamper growth, that hamstring entities large and small. They are regressive and they don't have a place anymore in the tax mix of a thriving economy like the Canadian economy. Last year Greg Duncan proposed to speed up the time for elimination of the capital taxes if the province developed the financial capacity and yesterday I was delighted to say in the legislature that we have that capacity now and we will eliminate capital tax in Ontario on July 1, 2010. We are also transforming the property tax assessment system. It's been a nuisance. It really didn't serve the people of Ontario well so we've changed it. We've thrown out the business of annual assessments, which gave rise to such volatility and we are putting in place an assessment system that will have a four-year cycle. If assessments go up, they will be phased in over a period of four years. If assessments go down, there will be immediate benefit of that assessment for the next four-year period. We are also improving the appeal system, because it again didn't serve the people of Ontario well. We are very, very proud of the way in which we have been able to transform that system and it will serve the people of Ontario much more effectively. I just want to wrap up with a few words about the impact of this budget on this great city of Toronto. As we reform business education tax, the businesses in this city large and small will, when fully implemented, pay $231 million less in business education tax. It's something that our mayor here has been calling for for some time and I was thrilled that we could deliver it in this budget. The elimination of the capital tax is going to strengthen financial markets in this city and ensure that we have a vital financial-services sector for years to come. The investment that we are making in kids: well let's face it, there's far too much poverty in the city of Toronto and part of that $2.1 billion is going to change the lives of many of the 2.5 million people who live in the city. We are investing in more housing so more housing will be built in the city. And we are investing significantly more in the arts. In my view as Minister of Finance I want to play some small role in making sure that Toronto expands its capacity as the great art and cultural capital of this continent. We made some new investments in the Ontario Arts Council and the Ontario Trillium Foundation and we helped to launch just a marvellous new enterprise called Luminato which will be a signature new arts and cultural festival, a festival of creativity, that begins on June 1 right here in this great city. I just encourage you to book off June 1 to June 10 because this is going to be a show that will attract the world. The objective is within a very short time to be at the level of the Edinburgh Festival and the festival in Venice. Given what I've seen about what's happening so far I think we are going to get there very quickly. Finally in the budget we begin the initiative that is going to dominate public policy around the world for many years to come and that is dealing with what the premier calls the defining challenge of our generation--climate change, the impact of global warming and the steps that we have to take to ensure that Ontarians adjust to a very different way of consuming and using energy on this marvellous planet. So there is a lot more to do. But yesterday was a particularly special day. We were able to announce that we brought the province back to financial health. We were able to say that we are entering a new era of economic strength and we were able to devote a good part of that new economic strength to the people who need it the most. Merci beaucoup. Thank you very much. The appreciation of the meeting was expressed by Rev. 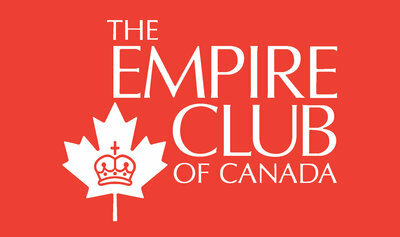 Dr. John S. Niles, Senior Minister, St. Andrew's United Church, Markham, and President, Empire Club of Canada.